SALT LAKE CITY (February 4, 2019) -For the seventh consecutive year the Salt Lake Bees are sending their beloved mascot Bumble to your special someone to ask if they will "Bee Your Valentine." 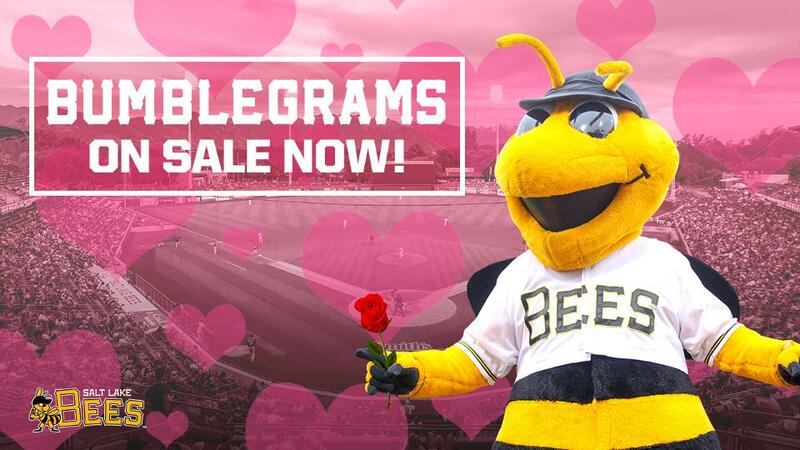 For $125, Bumble will make a special Valentine's Day delivery at a workplace or home with a bouquet of flowers, personalized card, box of chocolates and two ticket vouchers to a Bees game during the opening homestand at Smith's Ballpark April 9-15. Bumblegrams are available to anyone within 30 miles of Smith's Ballpark. Deliveries will happen on Thursday, Feb. 14 between either 10 a.m. to 1 p.m. or 2 p.m. to 4 p.m. Fans are encouraged to book early because space is limited and available on a first come, first served basis. To book your Bumblegram or for more information, contact Nikki Sim at nikki.sim@slbees.com. First pitch of the 2019 Bees season is exactly two months away as the Bees visit the Albuquerque Isotopes to start the season on Thursday, April 4. Salt Lake returns home to Smith's Ballpark to begin the home slate on Tuesday, April 9 against the Fresno Grizzlies. Season tickets and mini-plans are available now by calling 801-325-BEES with single game tickets going on sale in March.